Update (November 2018): Since this post gets so many hits (and is so high in search engine results), I’ve decided to update it whenever I visit Tokyo Disney with new flavors. Huzzah! Recently added include Soy Sauce and Butter, Strawberry, and Garlic Shrimp! The only thing I really knew about Tokyo Disney Land before heading over there was that they had a pretty nice variety of popcorn and popcorn flavors. Once I got there, I was able to sample some of those treats and see what the popcorn craze is all about. First, you can buy refillable popcorn buckets. They come in two varieties: the smaller, plastic ones that hold a regular bag. The second, and admittedly more fun, variety is the collectible bucket. These are large, plastic buckets molded like characters and boxes that can differ based on the popcorn vendor you buy from and the time of the year. Popcorn prices, as of summer 2017, are 2,300 Yen for a collectible bucket filled with popcorn, 530 Yen for a refill of your collectible bucket, and 310 Yen for a regular bag. I might be 100 Yen off on some of those, but you get the idea. If you’re going once, a collectible bucket is nice, but the price incentive and how much you need to buy to start saving money is around 20 buckets of popcorn. If you just want to try a variety, the regular size gives you a good amount of popcorn without breaking the bank. I managed to try four flavors while there. There are more than what I was able to try, but I am one man and can only eat so much popcorn. Found on the outskirts of the Venetian area at Disney Sea, Herb Tomato is a delightful savory treat. The tomato flavor, mixed with the Italian herbs, gives it a wonderful pizza flavor while not being overseasoned. This was easily my favorite flavor! A good standard for popcorn, caramel has mixed reactions from people. Thankfully, many of the concerns associated with caramel corn are resolved at Tokyo Disney Land. Found at multiple locations (I got mine outside of Star Tours in Tomorrowland), it gives you just enough drizzle of caramel to keep the popcorn that delightful, freshly-popped texture without destroying your jaw with a hard shell of caramel on the outside. Great if you love the sweeter side of popcorn! If you love honey, head over to Poo’s Hunny Hunt to grab some popcorn. It’s exactly what you think: popcorn covered in honey. If you love honey, you’ll love the flavor. If you’re not a big fan or on the fence about honey, I don’t think this popcorn will change your mind. Much sweeter than the caramel popcorn, in my opinion. I wasn’t a huge fan of this one, but I can see its appeal for others. Head down to Frontierland and just outside where you board the Mark Twain River Boat you can get some barbecue popcorn. Dusted with what tastes like a dry rub, you get a subtle hint of barbecue spices in each bite. Much more mildly flavored than the Herb Tomato, but still an enjoyable snack. By the bridge leading from the Arabian Peninsula to the Mermaid Lagoon in Disney Sea is the curry popcorn stand. You will smell it before you see it! It has a light curry flavor with zero spiciness to it, so no need to worry about that. If you like curry, this is good for you. At the American Harbor near the SS Columbia and Tower of Terror is the Blueberry popcorn stand. I think this one might be a seasonal, so we’ll see if it’s around later. It’s sweet but not too much so. It reminds me of a breakfast cereal taste, almost like Captain Crunch. I wasn’t super fond of it, but it had a reasonably blueberry flavor to it. This is one of the trusty stand-bys at Tokyo Disney Land, and I finally got myself a bucket to try! I was surprised: it’s much more sweet than I imagined. I thought it would be a nice savory butter flavor with a salty soy sauce mix, but it was far more sweet. I couldn’t tell if the sweetness was from the soy sauce or the butter, but it overpowered. I couldn’t taste much of any soy sauce. A very confusing foray into popcorn for this flavor. New fruit enters the American Harbor! It’s right by where the Blueberry once stood, usurped by the Japanese-favorite strawberry! 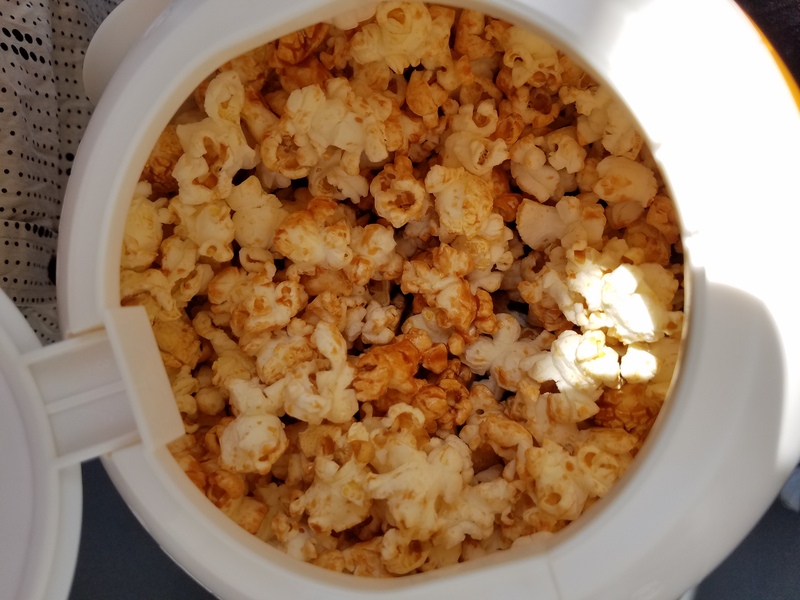 This one wasn’t nearly as sticky as other sweet popcorns; it had a nice balance of flavor with the salty popcorn base and the lighter strawberry powder. It had a very nice balance and actually tasted faintly of strawberries. This one was right next door to the Strawberry, but its smell was overpowering everything in the vicinity! You could smell the garlic a mile away! The flavor’s front was a bit garlic-y, but the back was a very strong flavor of shrimp. It is an interesting savory taste, but not if you don’t enjoy seafood quite a bit. The Mrs. and I couldn’t really finish the small amount we purchased. Something about the flavor wasn’t the best for us at the time, but I’m sure others will find it delightful. When I’m able to taste more flavors, I’ll update the post, so be on the lookout for future updates! What are your favorite flavors of popcorn at Tokyo Disney (or anywhere else)? Let me know in the comments!